How to put together a printed PDF pattern, pattern alterations, choosing a size and tracing off. Fabric suggestions, layout, cutting your fabric and block fusing. Sewing the shoulder seams and neck facings. Sewing the bound waist tie openings. Sewing the shoulder buttonholes by machine or hand. Sewing the waist tie and finishing off the cape including alternative ways to finish the hem. 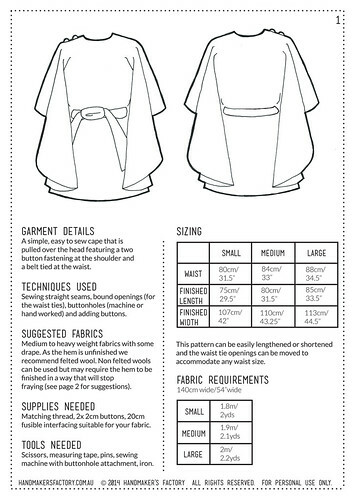 A simple, easy to sew cape that is pulled over the head featuring a two button fastening at the shoulder and a belt tied at the waist. This pattern can be easily lengthened or shortened and the waist tie buttonholes can be moved to accommodate any waist size. 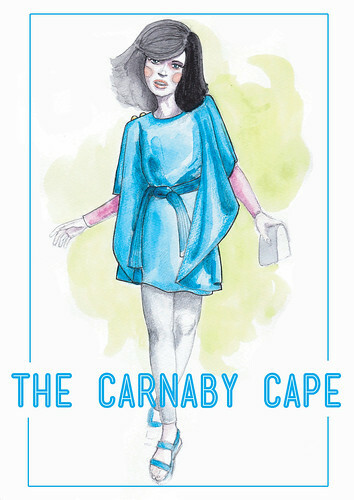 A copy of The Carnaby Cape pattern. Fabric (1.8m - 2m) Heavy weight fabrics with some drape. As the hem is unfinished we recommend felted wool. Non felted wools can be used but may require the hem to be finished in a way that will stop fraying. Scissors (paper and fabric), measuring tape, pins, sewing machine with buttonhole attachment and an iron.